Traditional Roast Turkey with Chestnut Stuffing | Just The Right Spice! Before you know it, it will be Thanksgiving so here is a traditional roast turkey recipe with chestnut stuffing and homemade gravy for you to enjoy with your family. Roast turkey makes a wonderful meal any time of the year so don’t save it just for the holidays. Directions for the Stuffing: To roast the chestnuts, cut an X on the flat side of each chestnut and bake 15 to 20 minutes at 375 °F oven. Let cool for 10 minutes and then peel and chop. Do not turn oven off as it will need to be preheated for cooking the turkey. In a large pot over low heat, heat the oil then add onions and celery. Sauté for about 3 minutes or until soft. Stir in crushed garlic, sage, rosemary, thyme and apple and sauté for a further 3 to 5 minutes. Remove from heat and stir in egg, then add chestnuts, raisins and bread. Toss mixture well. Stir in warm broth made with 1 cup boiling water and 1 teaspoon chicken soup and gravy base, season with salt and pepper. Set aside to cool. Directions for preparing the turkey: About one hour before cooking, prepare your turkey. Remove any giblets and rise well (inside and out) with cold water, then pat dry with paper towels. Generously rub turkey with grapeseed oil and sprinkle with salt and pepper. Loosely stuff the neck cavity with chestnut stuffing, fold the skin under and secure in place with a toothpick. Then loosely stuff the main cavity, making sure to leave room for expansion and the air to flow through. Then prepare your roasting pan. Add carrots, onion and celery to the bottom of a large roasting pan. Place the rack over the vegetables. Now place your turkey, breast side up, on the rack. Put prepared turkey in oven. Roast, uncovered, at 375 °F for the first 30 minutes, then baste and reduce oven temperature to 325 °F. Continue basting turkey every 25 to 30 minutes. The cooking time should be approximately 20 minutes per pound of turkey, which would be about 3.5 hours for a 10 lb turkey. To check if the turkey is cooked pierce the thigh bone, juices should run clear without any pink. Or use a meat thermometer on the thickest part of the thigh. The temperature should show 180 °F. Turkey should be golden and crispy on the outside too. 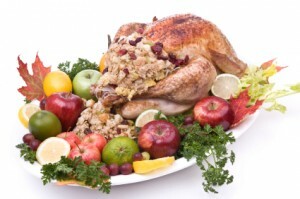 Remove the turkey from roasting tray and reserve juices for gravy. Directions for the Gravy: Mash the vegetables in the roasting tray, then push all ingredients through a sieve or use a hand blender. Discard any remaining vegetables or fat. Place the sieved liquid in a saucepan and simmer over low heat. If you don’t have enough liquid then add 1 cup or more (depending on how much gravy you need) boiling water and chicken soup and gravy base. In a small bowl add 1/4 cup flour and mix with about 1/2 cup cold water until all lumps dissolve. Slowly add a little of this mixture to the saucepan, stirring well after each addition and allowing time for gravy to thicken. Keep adding flour/water mixture until gravy is desired thickness. Taste and season with salt and pepper if needed. For extra added safety, remove the stuffing from turkey once turkey is cooked, serve right away and store left overs in a separate container in the fridge. Try adding a couple of tablespoons of red wine or Madeira to the gravy for a richer taste. The alcohol will evaporate during the cooking process so the children will be able to have the gravy. Allow roasted turkey to stand or rest for 15-20 minutes for best results. This allows the natural juices to redistribute throughout the meat so it doesn’t get too dry. You find just the herbs and spices to cook your turkey in the Watkins US catalog or the Canadian catalog. Enjoy! This looks so delicious! This time of year I start looking for recipes like this to get me into the “Fall cooking mood”! Thanks for a great one! Printed it off and saved it in my recipe binder! Thanks Jennifer, I sure do hope you enjoy it! WOW! Now that is a turkey with all the trimmings. This Thanksgiving my brother is doing the cooking for our elderly parents. I will forward this recipe to him. It will be our best Thanksgiving ever!